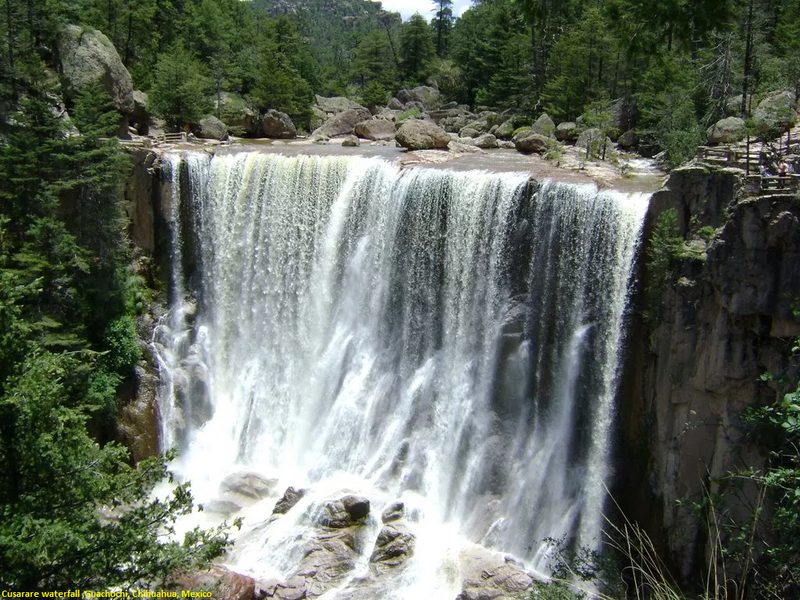 Very nice falls, about 30 meters high and very wide. Really quite spectacular during the rainy season when it's flowing at full capacity, not so much the rest of the year and at times it's just a trickle.This tranquil, pretty spot, the Cusarare Falls, is one of the most popular destinations for visitors to the Sierra Tarahumara. 'Cusarare' meaning 'Place of the Eagles' to the Raramuri, is an apt name for this small, side canyon that abuts the much larger canyon system of La Barranca del Cobre. Once the haunt of the Golden Eagle (Aquila chrysaetos), the majestic bird is now only found in the most isolated areas. A rugged trail leads down to the base of the waterfall with its little pools that are great swimming holes when the water level is low. Below the waterfall, the Cusarare Canyon narrows considerably with great boulders marking its path and the relatively short distance to the Urique River becomes a grueling 3 day trek. The Basirecota Thermal Springs, located in the lower section of the Cusarare Canyon. Fourteen miles (22 kms.) south of Creel along the Creel to Guachochi road, there is a sign that marks the turnoff to the Cusarare Falls. This 2 mile (3km.) dirt road gives way to a trail that leads to the top of the waterfall and continues down to the bottom of the waterfall.